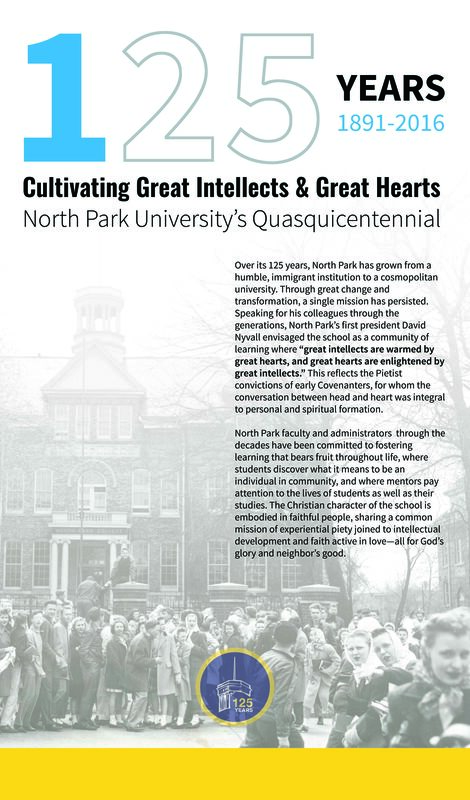 Now, North Park is Chicago’s city-centered Christian University. It serves nearly 3,200 undergraduate and graduate students from around the country and the world. Within a diverse, close-knit community, it offers a values-based education to students through more than 40 undergraduate majors, as well as graduate and continuing education in business, nonprofit management, nursing, education, music, and theology. Campus facilities have been extensively renovated, including the LEED-certified Johnson Center for Science and Community Life, the Helwig Recreation Center, the Holmgren Athletic Complex, and the Brandel Library. Founded in 1891, the origins of the University are rooted in 19th-century immigration from Sweden, the faith traditions carried from the homeland and established in a new world, and the educational needs of an immigrant denomination, today’s Evangelical Covenant Church. The first quarter-century was encompassed by challenge, growth, and transition. 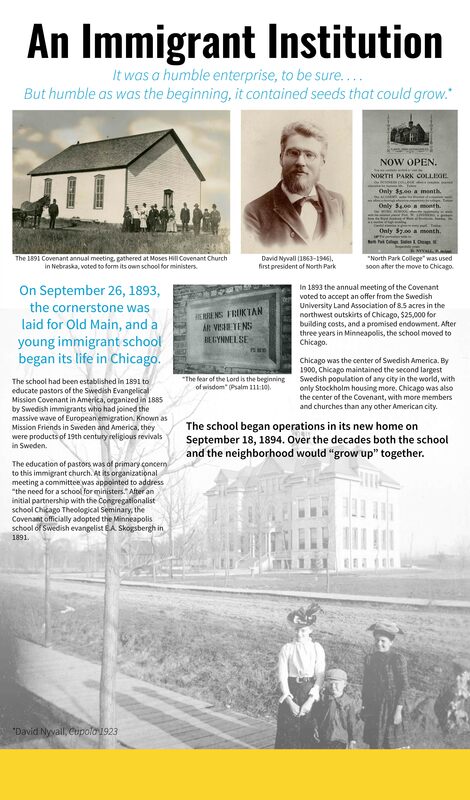 Classes in Chicago opened in 1894, all within five departments: Seminary, music, business, academy, and primary. When the First World War began, first- and second-generation immigrants made up one-third of the American population. By 1917, College courses were taught entirely in English with English textbooks. 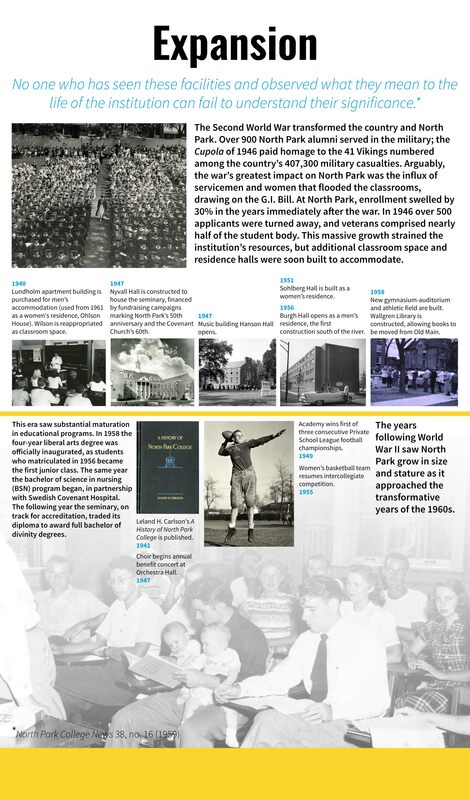 The Second World War transformed the country, the Covenant Church, and North Park. Servicemen and women who took advantage of the G.I. 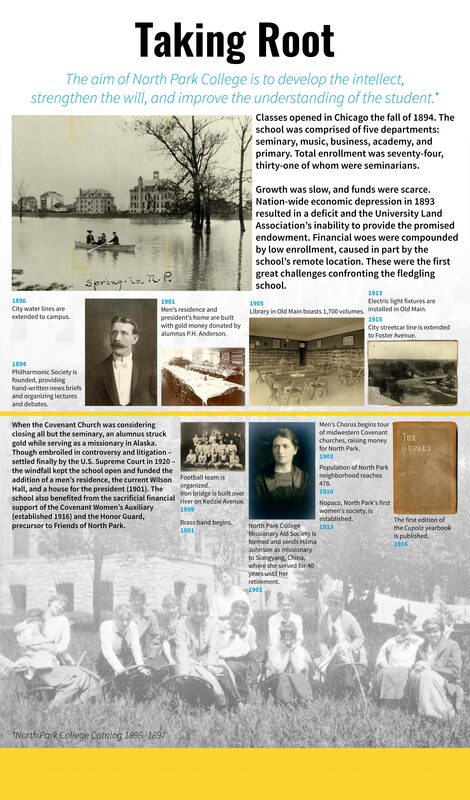 Bill increased enrollment and led to growth. 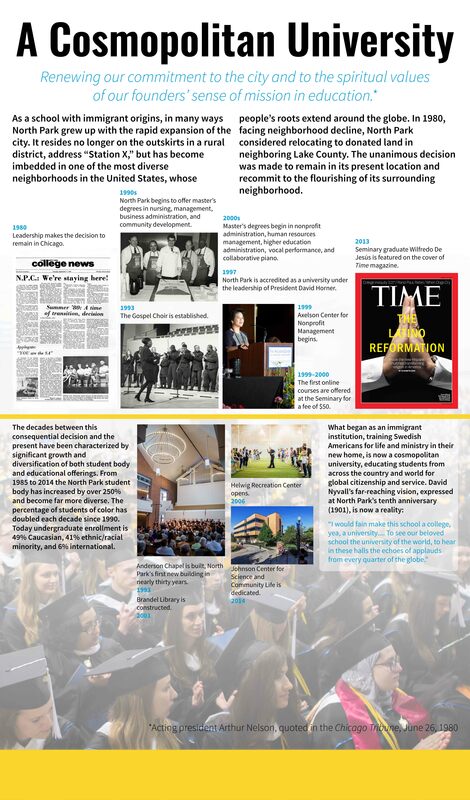 North Park graduated its first four-year college class in May 1960. Concern over the challenges of the country found clear expression at North Park, with students protesting, marching, and calling for justice. The 1960s also brought new buildings and the College’s first faculty member of color, L. Roger Boncy, a former U.N. employee. In 1980, facing neighborhood decline, North Park considered relocating to donated land in Lake County. A unanimous decision was made to remain in its present location citing the recognition “that our urban location has been instrumental to the quality of education our people receive.” The decision was motivated by concern for the vitality of the community and represented a commitment to reinvesting in the neighborhood’s revitalization. 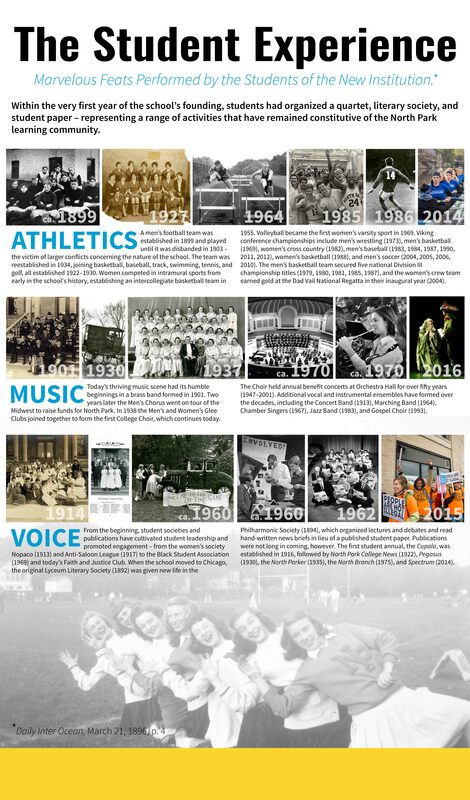 Within the very first year of the school’s founding, students organized a quartet, literary society, and student paper. 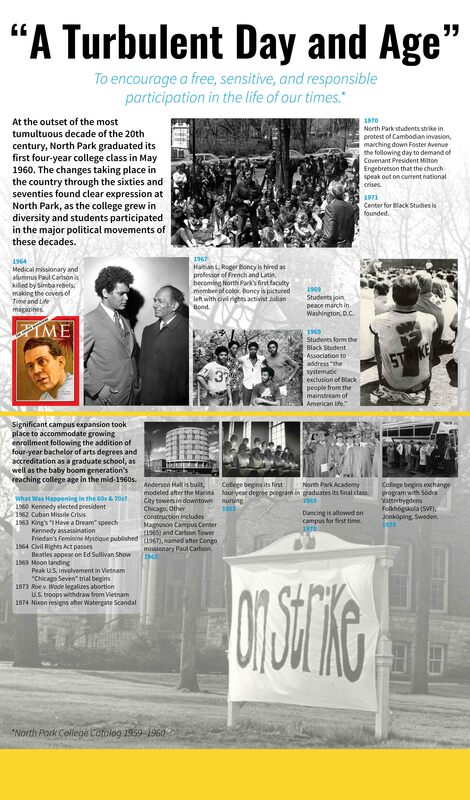 From the beginning, student societies and publications have cultivated student leadership and promoted engagement—from the women’s society Nopaco (1913) to the Black Student Association (1969) and today’s Faith and Justice Club. 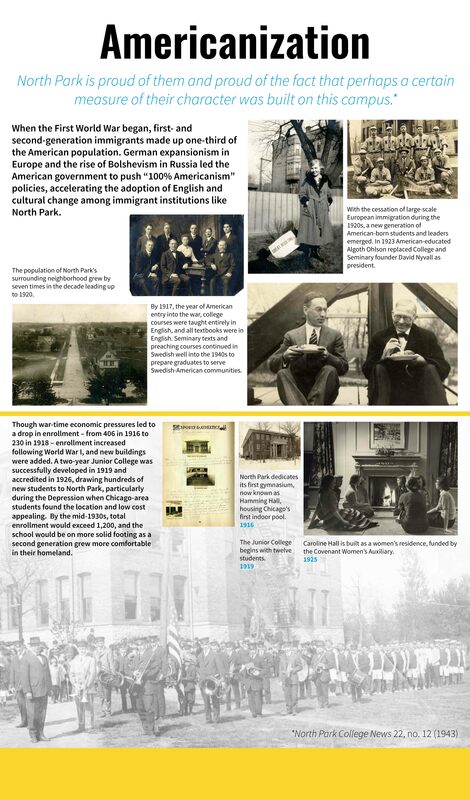 Images here are from the Historical Photograph Collection of North Park University Archives. Copyright of the images are managed by the Covenant Archives and Historical Library at North Park University or we have been unable to identify the copyright holder.